Most good artists have spent their lives exploring one idea: transposing, adjusting, and refining it, applying it to different specific problems, disassembling and reconstructing in all possible configurations the component parts of the basic conception. In photography, perhaps because of the speed with which the medium itself has changed, only a very few workers have been able to maintain the vitality and plasticity of their conception for a full working lifetime. The genuinely creative period of most photographers of exceptional talent has rarely exceeded ten or fifteen years. 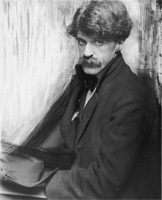 Alfred Stieglitz (like his younger friend and rival Edward Steichen) is a conspicuous exception to the rule. Stieglitz (like Steichen) avoided stagnation not by remaining constant to a single concept throughout his long lifetime, but rather by pausing at least twice in his maturity to consider his goal and rechart his course. Stieglitz lived at least three lifetimes as a photographer, each producing a body of work that was formidable and distinct from others. Until Stieglitz was past forty, most of his photographs were strongly influenced by aesthetic values inherited from traditional painting. Only occasionally did his interest in difficult technical problems lead him to radically photographic imagery. Sometimes before 1910, after a period of relative inactivity, the character of his work changed. It is as though the earlier pictures were ideas recorded by his camera, and the new ones ideas discovered within it; in conception and execution the portraits and cityscapes of this period had a directness and immediacy that made most earlier art-motivated photography seem once-removed from real experience. After the early twenties Stieglitz's work turned more and more inward and became increasingly personal, pure, and self-contained; at times indeed it expresses the imperious and secretive loneliness of genius confronting death. 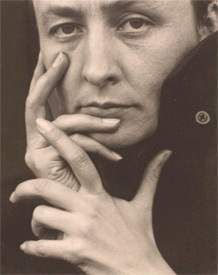 Stieglitz made this portrait of Georgia Engelhard when he was in his mid-fifties, and at the height of his creative powers. The picture poses and resolves several of the central issues that had occupied Stieglitz throughout his career: It is first of all a compelling portrait, remarkable for the physical and psychological presence of this beautiful child of summer. Within the basic format of the common snapshot Stieglitz has contrived a design of great eloquence; the gesture of the girl's body and the line of its silhouette express the poise and the potential of a taut spring. 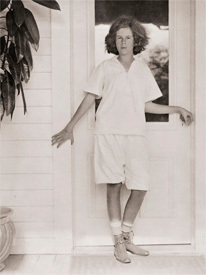 The detail of her right arm suggests the tortuous beauty of his great cumulative portrait of Georgia O'Keeffe. And the picture is made whole by light, also a presence --- no tone or texture is unresolved; from corner to corner, like an insubstantial tapestry, the light justifies a perfect space. 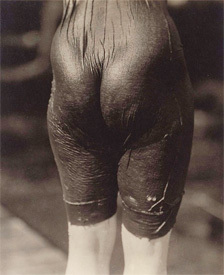 This two-volume boxed set is the catalogue of the Alfred Stieglitz Collection of Photographs at the National Gallery of Art, Washington, the most complete Stieglitz holding in the world, donated to the gallery by his widow, the artist Georgia O'Keeffe. Numbering 1642 photographs, the collection represents the full range of the master photographer's work - from early studies made in Europe to views of the majestic New York skyline to intimate portraits of O'Keeffe. All 559 illustrations from most important periodical of art photography. Reduced in size but still clear, in strict chronological order, with complete captions. By detailing his many pursuits and passions, his turbulent relationships and pioneering work, this biography provides a chronicle and contribution to the history of American art. The arts equally have distinct departments, and unless photography has its own possibilities of expression, separate from those of the other arts, it is merely a process, not an art; but granted that it is an art, reliance should be placed unreservedly upon those possibilities, that they may be made to yield the fullest results.